Autumn Garden 2 of 2. 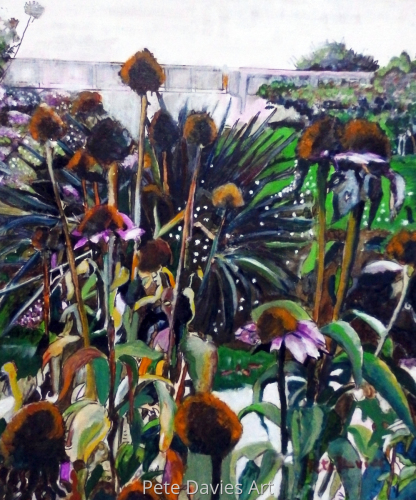 The second of a series of two oil paintings of the flowers in my garden in December. 16.75" x 14"20.5" x 17"24.25" x 20.25"
One of a series of two oil paintings of the flowers in my garden in December. 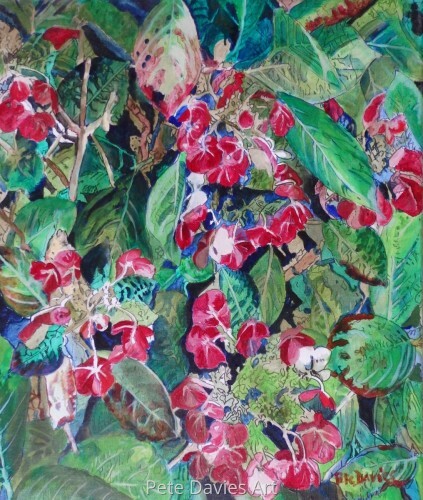 17" x 14"20.5" x 17"24.5" x 20.25"
A decorative, colourful oil painting of the Lace Cap Hydrangea that grew in my garden this Autumn. 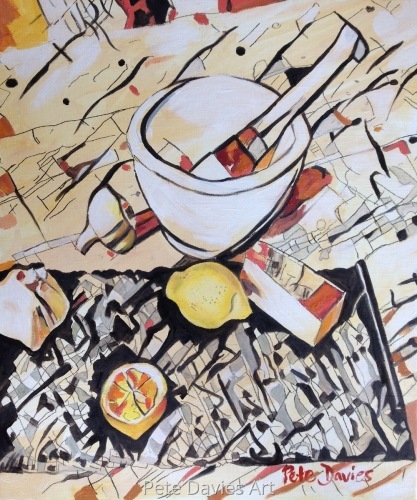 13" x 11"15.25" x 13"17.5" x 14.75"
A print designed to grace any kitchen or dining room. These tomatoes are part of this year's crop from my greenhouse in the garden. I hope they brighten your wall as much as they have mine! 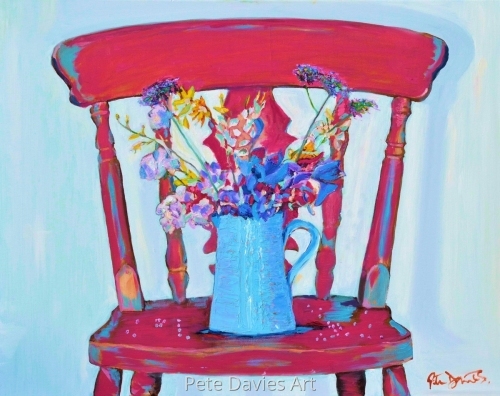 10.75" x 9"11.75" x 10"
This is the second chair which my wife Helen painted blue in a shabby chic style. 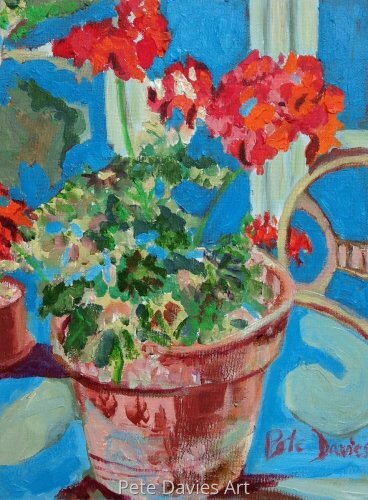 The geraniums were picked fresh from the garden. When they were put on the chair a variety of interesting shadows were produced which I wanted to record in paint. 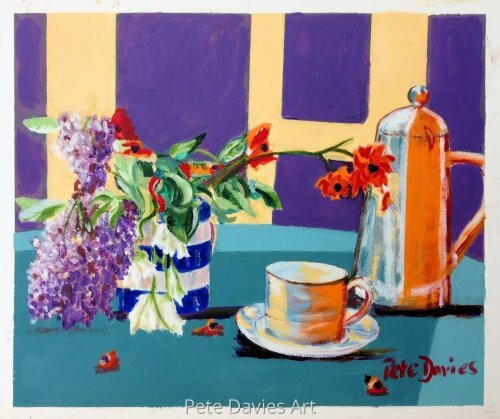 A summery painting to brighten any room. 11" x 8"12.25" x 9"
My wife Helen decided to paint the kitchen chairs in reds, blues, whites and greens in a shabby chic style. 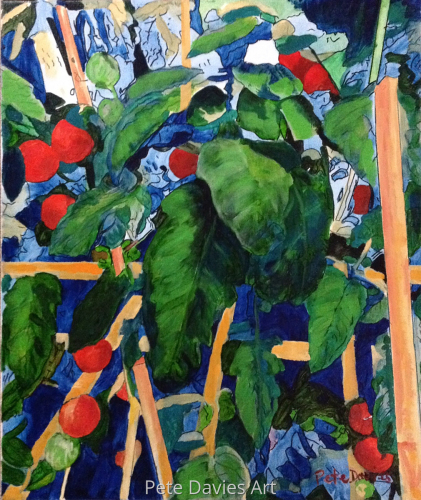 Originally I wanted to paint each of them reflecting light in the garden. I wanted to make colorful decorative art for the kitchen which I think I achieved. This is the first of four paintings. 14" x 17.75"17" x 21.5"20" x 25.25"
I love this painting. Often, in the early morning, I sit in the summer house, doors open to the garden, listening to the dawn chorus and drinking coffee as I think about my next work. 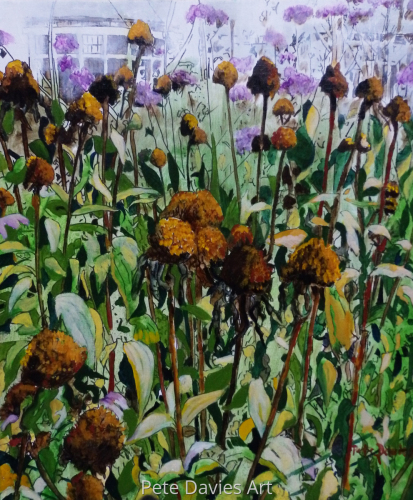 ‘In the Potting Shed’ is a fusion of all the creative elements of gardening and painting recreating the mysterious and atmospheric feel of my grandfather’s potting shed when I was young. I believe there is something timeless about wood, terracotta and soil that connects us organically to the earth. I started the painting by first creating the shapes and earth shades using burnt umber. Once I was happy with the form, I gradually built up layer upon layer of glazed oil paint until the desired colours, texture and tones were produced. I hope I have conveyed the organic, earthy smell of the potting shed, a retreat for all serious gardeners! 16.5" x 11"25.5" x 17"31.5" x 21"
This is a festive painting representing the aftermath of Christmas revelry. 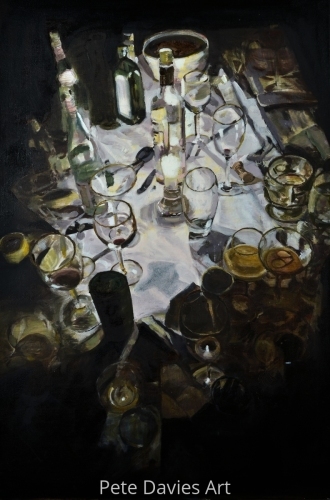 The painting was originally filled with many more glasses which gradually disappeared as I worked on the chiaroscuro. 21.25" x 14"25.75" x 17"
Your Turn to make the Coffee! This is one of my first acrylic paintings painted on linen. It's a picture of summer lilac and flowers - which I picked from our garden - combined with the aroma for fresh coffee, making a picture that would brighten up any kitchen. Buy it now! 9" x 10.75"12.5" x 14.75"
This is my second painting in acrylics on linen. I enjoyed the immediacy not found in traditional oil painting which is my usual style. 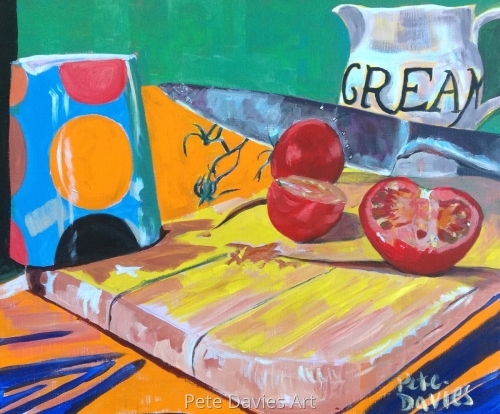 It is another joyous, simple celebration of colour to brighten up any kitchen wall. 9" x 10.75"11.5" x 13.75"
Do you like cooking? Italian food? This print shows the preparation of a classic Italian dish. You can see the pestle and mortar, smell the sweet lemons, relish the garlic and a the tasty chunk of Parmesan cheese, all lying together on a slate cheese board. You can hear the pan boiling and smell the rich aromas wafting around the kitchen as you open the bottle of wine. 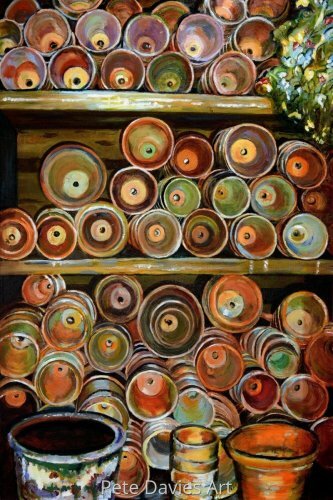 This print is a marvelous addition to your kitchen giving it that authentic homely touch. And the meal? It is risotto! 10.75" x 9"14.25" x 12"
This is interesting. 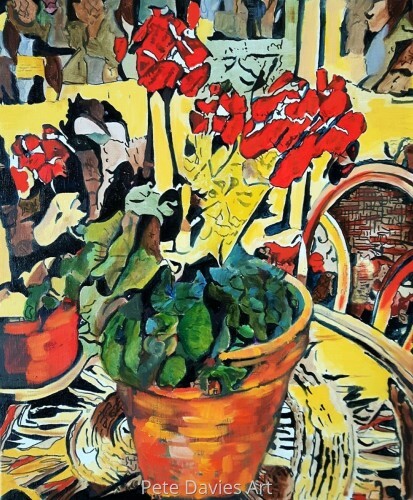 There are at least 9 animals and one fish in this bright, colourful print of geraniums on a table. If you look at the top of the picture you will also see various characters talking in a cafe scene. This is one for those who have a perceptive eye. Lovely and intriguing at the same time. Buy now and brighten up your home!